I bet you’re wondering what those pictures are all about. You’ll just have to keep reading to find out. Savvy Verse & Wit turns two years old on June 12, and the blog has gone through a number of changes since I began. Why am I making this announcement today? Well, it’s simply because I have two book tours scheduled for June 11 and 12. Savvy Verse & Wit now has its own DOT COM address, the look has changed, and the content has grown. Thanks to all of you readers that have stuck with me over the last two years, and welcome to those new readers who have recently or not-so-recently discovered Savvy Verse & Wit. Ok, the photos. These are just some of the prizes up for grabs. 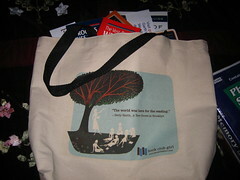 The first is a Book Club Girl canvas bag, which I snagged at Book Expo America, which I have stuffed with some cute little writing helpers, some Garth Stein swag, and some surprise items. 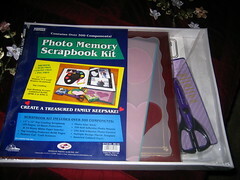 Second is the Scrapbooking kit, which can go one of two ways. You can either provide me with .JPG images and I will create a scrapbook original for you or you can simply win the kit and make your own. I’ll leave that bit up to the winner. A third prize is still in the works, and perhaps some smaller prizes. Since the deadline for this giveaway is far off–July 11–I’ve decided to make it a rolling entry. Each week, there will be a post with a quotation, and you will have to guess who said it. 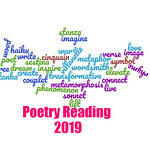 You get one entry for each correct guess, plus entries for comments on this post about why you follow Savvy Verse & Wit, when you first started following (this can be an approximate date or number of months/years), and a link to one of your favorite posts from Savvy Verse & Wit. 1. Comment on this post with the answer to the quote. 2. Comment on this post about why you follow/read this blog. 3. Comment on this post about when you first started following this blog–an approximation. 4. Leave a link on this post to one of your favorite Savvy Verse & Wit posts. 5. Stay tuned for a new quote each week for another chance to enter. Also, check out my Holly Denham Giveaway, which ends tonight.